Jane Yolen is one of the most distinguished and successful authors for young readers and adults in the country. She is the author of more than 200 books--including Briar Rose, Sister Light, Sister Dark, Owl Moon, and the immensely popular The Devil's Arithmetic. Her books have won awards including the Caldecott Medal, two Nebula Awards, the World Fantasy Award, the Jewish Book Award, and two Christopher Medals. SFWA named her the 2017 Damon KNIGHT MEMORIAL GRAND MASTER for her contributions to the literature of Science Fiction and Fantasy. She lives in Hatfield, Massachusetts. 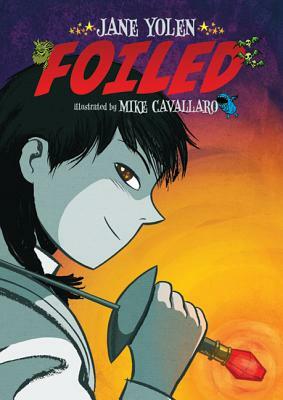 MIKE CAVALLARO is from New Jersey and has worked in comics and animation since the early 1990s. His comics include “Parade (with fireworks)” (Shadowline/Image Comics), a Will Eisner Award-nominee, "The Life and Times of Savior 28” (IDW), with Eisner Award-winning writer J.M. DeMatteis, The “Foiled” series with Jane Yolen, and “Decelerate Blue” with author Adam Rapp, all published with First Second Books. Mike is an instructor at the School of Visual Arts in NYC, and is the Vice-Chairman of the Manhattan Chapter of the National Cartoonists Society.